We pride ourselves on having the best Mexican food in the area. All of our dishes are prepared fresh using only the finest ingredients and served to you hot and delicious. Enjoy! Grilled shrimp with fajita sautéed vegetables, squash and mushrooms, rice, guacamole salad and tortillas. Grilled shrimp and scallops served over a bed of rice, covered with queso dip, served with guacamole salad, sour cream and tortillas. 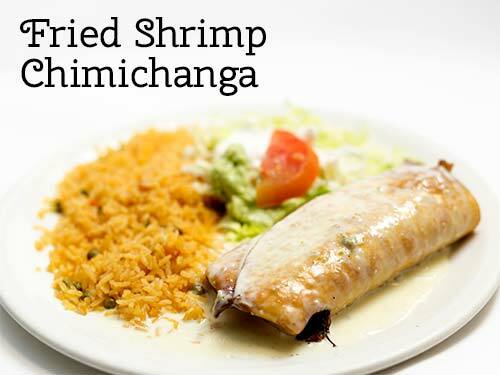 Cooked shrimp rolled with a bacon strip, deep fried, served with lettuce, sour cream, tomato, shredded cheese and white Mexican rice. 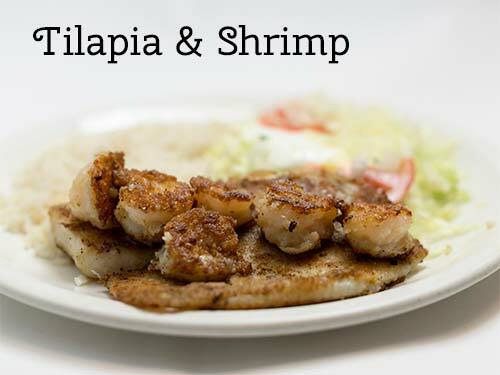 Grilled tilapia and shrimp, served with Mexican white rice, crema salad and tortillas. Shrimp cooked in lime juice to keep it original and tasty, mixed with diced tomato, chopped onion, jalapeños, cilantro, and diced avocado. Served with saltine crackers or use your table tortilla chips! Twelve shrimp in a tomato-based, sweet & sour sauce, shrimp, pico de gallo chopped in, avocado and cucumbers diced in. Served with saltine crackers and use your table tortilla chips! Grilled marinated shrimp cooked with red and green bell peppers, zucchini, squash and onions, served with rice, black beans and tortillas. Marinated shrimp with Diabla sauce. Served with rice, guacamole salad and tortillas. Grilled salmon served with white rice, corn, crema salad and a slice of onion.